- Check state certification and licenses of kindergarten. - Notice how well the social base of the company is provided, whose office kindergarten is, if it is a rich organization. Otherwise, you risk paying for the dubious quality. Private kindergartens are ideal in the absence of financial difficulties. They work usually up to 20-00 or 21-00, or a clock. In private kindergartens there is very intense and rich program of development. Private kindergartens are generally well supplied with toys and games, visual aids; children can be taken out to a nearby urban zone for a walk. Control over the work of non-state preschool is done by means of licensing, accreditation, certification programs and certification of teachers. - varied and tasty food, the ability to cater to every child, an individual approach to children, which allows maximum reveal their abilities. Each group has several teachers; the development of the children is watched by speech therapists, psychologists, pediatricians, subject teachers. - parents have the right to influence the learning process - for example, through the board of trustees. In particular, they can inspect the kitchen, demanding a report on financial activities even attend classes. - Many private kindergartens run by the system "kindergarten - school". The only disadvantage of the private kindergarten is its cost. - Note the proximity of the house to the kindergarten. Even a very good kindergarten will not suit if the road takes more than half an hour by car. By the way, some private kindergartens provide service to ship children to and from kindergarten. - Check out the license for educational activity, the Charter of the institution and the contract. Find out whether the kindergarten has the document on area which it occupies at the moment. The agreement should contain a set of services, payment terms and conditions of stay of the child in kindergarten. All rights and obligations of the parties should be thoroughly discussed and included in the contract. And in order to protect yourself from unexpected expenses, get the phrase in documents - "the price paid under the contract can not be changed during the tenure of a child in preschool". - Check out the menu. Inspect the room, toys, area for walking, pay attention to the behavior of educators and their interaction with the kids. - Learn about the program and about the procedures, which work in the garden. 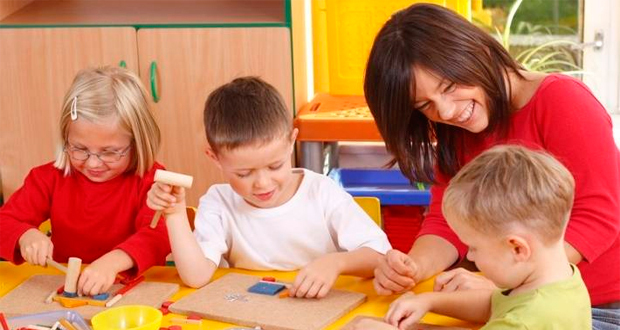 Find out which school is aimed at kindergarten - private or general education. - You can ask an additional question on the education of the person who directs the kindergarten and the degree of qualification of teachers, doctors and educators - in a good kindergarten you will be provided with detailed information. Ask who will carry special subjects. - Find out which mode a nurse and a doctor work. - Pay attention to the life period of the kindergarten, five years for our country is a considerable period. Home Kindergarten (family kindergarten) is another type of private kindergarten. Typically, a couple contains it in their apartment, or founders rent the room where equip the bedroom and playroom. They invite teachers, nanny and cook and for older kids - teachers of foreign languages, music, drawing. - individual approach to nutrition. - Problems related to the lack of equipment or facilities.